The project concentrates on the sketch process of new 2D forms, and their translation into 3D using plastic forming techniques. 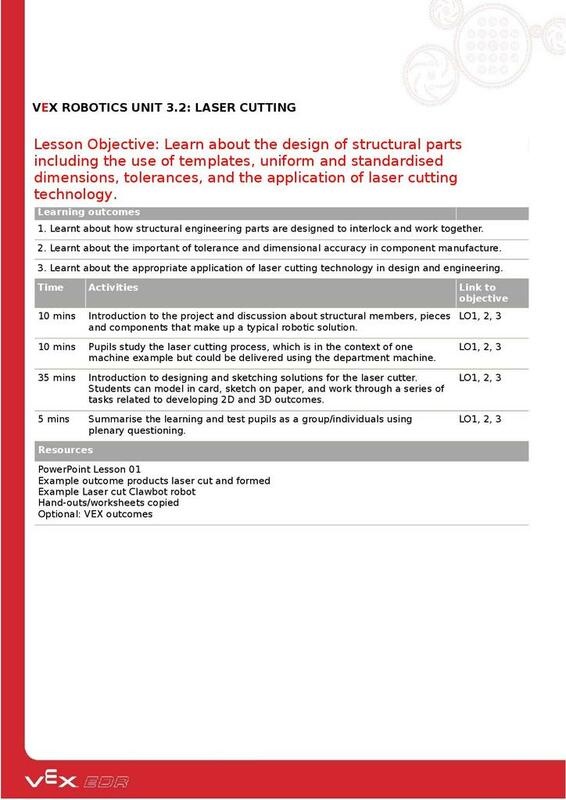 Through sketching there will be a process of modelling and iterative design exploration, leading to the development of a potential final solution that can both perform better towards a specific design challenge, and achieve new structural build options using these unique parts. 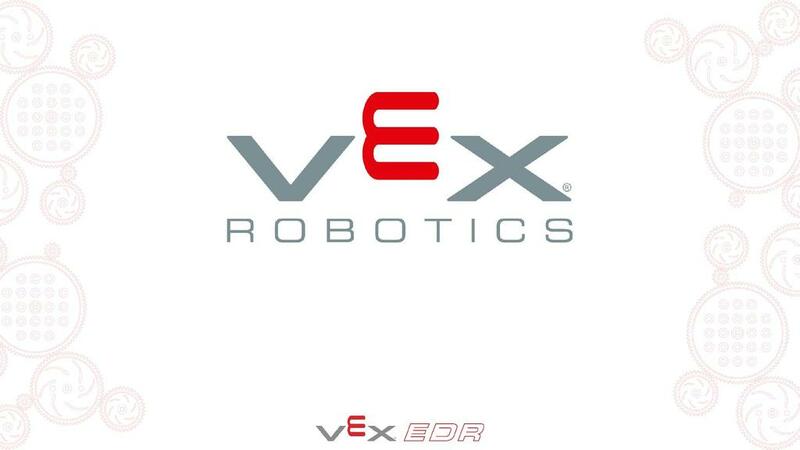 Once the build is complete, students will need to plan test and evaluate the performance of their robotics solution, including the consideration of; performance towards a challenge goal; performance of the materials in use; performance of the formed parts; tolerance and ease of assembly of formed parts for the product outcome. 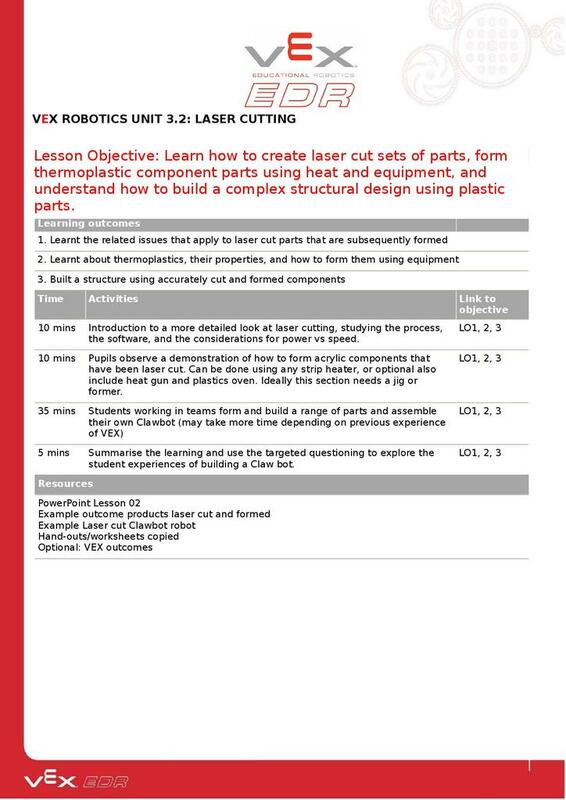 * Lesson 01 - Introduction to the project and discussion about structural members, pieces and components that make up a typical robotic solution. 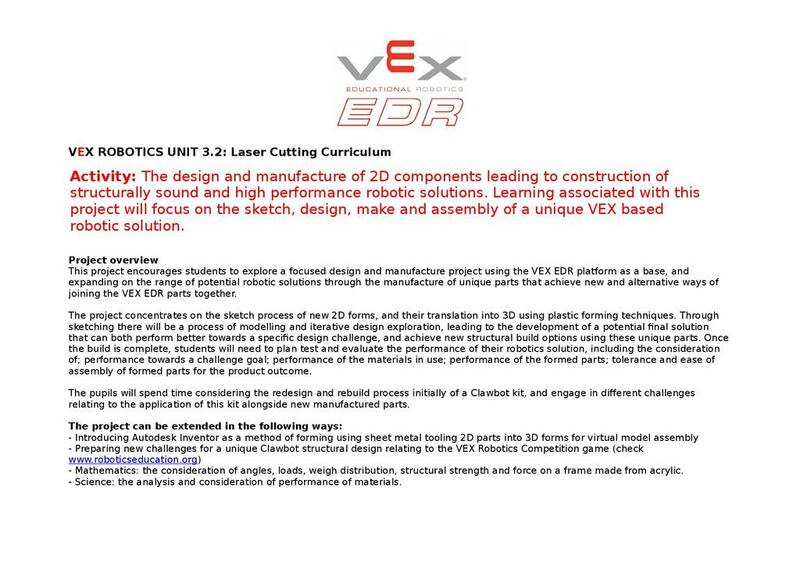 Pupils will also be Introduced to designing and sketching solutions for the laser cutter. 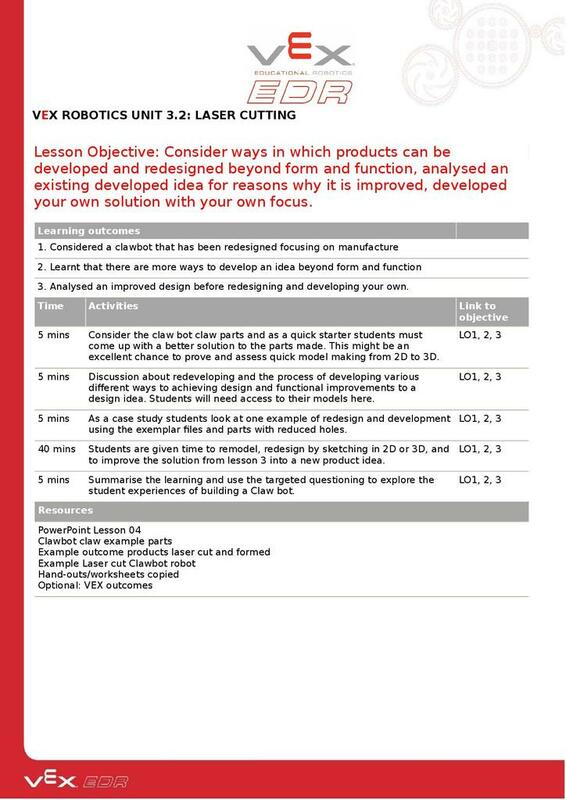 * Lesson 03 - Creative design task starter. Students design a robotic solution they will fabricate using card before committing to acrylic. Students observe safe practice using cutting matts, and craft tools of that nature to prepare parts to be glued together. Students work again in teams to make parts. Team roles (cutter, former, glue-er, builder, designer, marker) will be needed for success. * Lesson 04 – Pupils will consider a Clawbot that has been redesigned, focusing on manufacture, and learning that there are more ways to develop an idea beyond form and function. 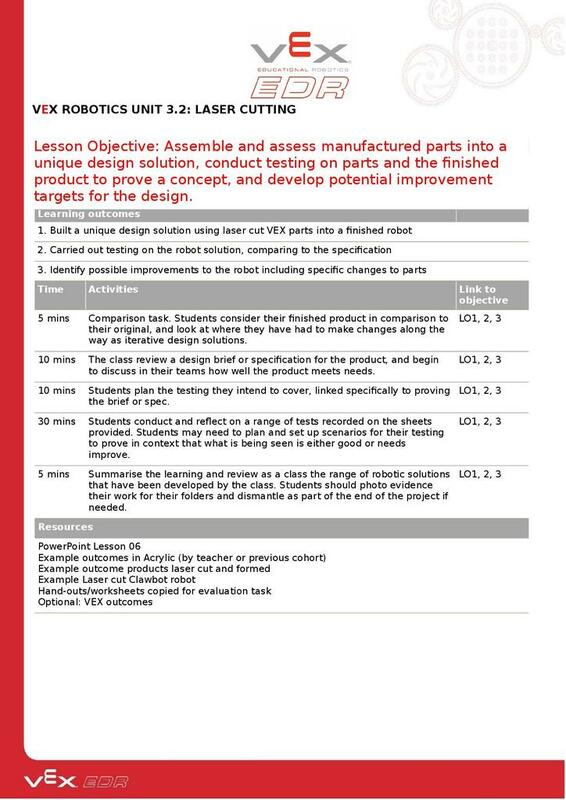 Pupils will then analyse an improved design before redesigning and developing their own. 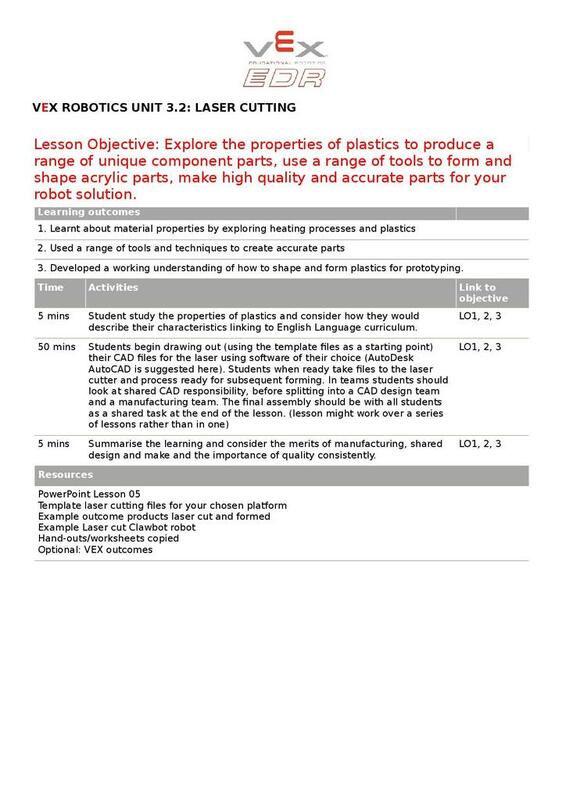 * Lesson 05 – Pupils will Learn about material properties by exploring heating processes and plastics, use a range of tools and techniques to create accurate parts, and Develop a working understanding of how to shape and form plastics for prototyping. 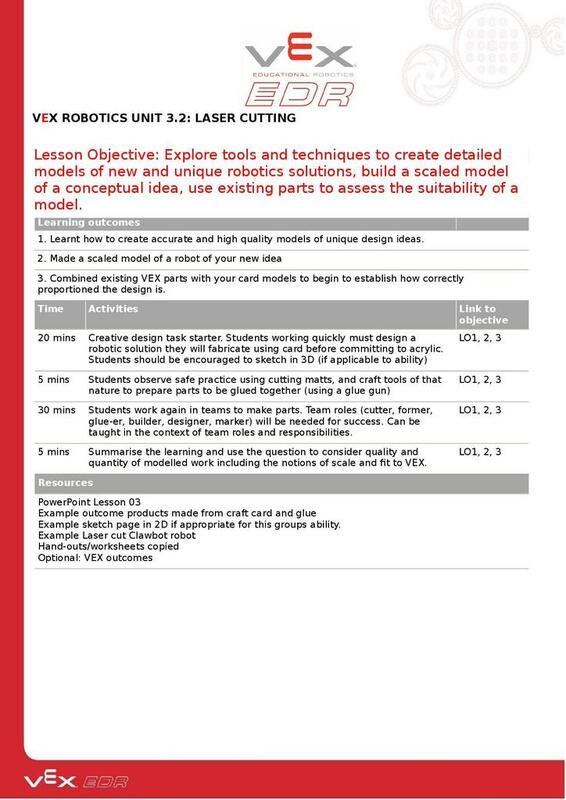 * Lesson 06 – Pupils will build a unique design solution using laser cut VEX parts into a finished robot, carry out testing on the robot solution, comparing to the specification. They will then identify possible improvements to the robot including specific changes to parts.